Original Design Bags: Classic and Timeless Design, Durable and Comfortable Material, Reasonable Price. 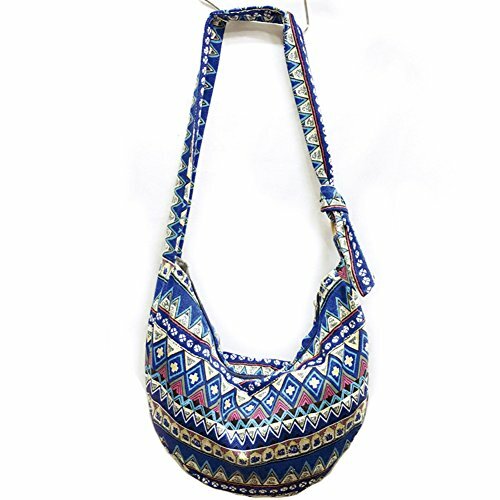 KARRESLY Bohemian Cloth Crossbody Bag, MiMi Series is made of cotton cloth with a unique Bohemian artistic look. With a knot tied to the small wooden ring, you can adjust the shoulder strap length, easily convert to a shoulder bag or crossbody. The wide strap lessens the pressure on your shoulder and top zipper assures the security of your personal belongings with inside pockets for sort and separation. It is perfect for school, daily outdoor activities like carrying books, laptops, personal belongings, grocery shopping or while travelling. Washing Instruction: Hand wash separately in cold water and avoid soaking; Inner denim texture may fade from frequent washing. This roomy and durable bag is good for all day use, but has fashionable color to select from as well. Fully Lined with zippered main compartment along with a native wood button clasp, inside zippered pocket and a reinforced base that doesn't intrude on this roomy hobo. 100% cotton fabric construction. Best match:a good match to the outfits, many colors available to match your young girl jacket or your elegant lady dress. Note :Actual color may vary from picture due to computer settings. Please allow 0.1-1.1 inch in size deviation. If you have any questions about this product by KARRESLY, contact us by completing and submitting the form below. If you are looking for a specif part number, please include it with your message.